Our team members are dedicated to the well-being and optimal health of the pets in our care. We believe in client education and strive to meet the unique needs of both the pet and its owner. We stay abreast of our field through a commitment to ongoing continuing education courses. The PetStar Animal Care team thanks you for choosing us. We understand how much your companion animal means to you, and we treasure the extraordinary bonds that exist between pets and their owners. Dr. Ashley Turner was born and raised in Bossier City, LA. She began her undergraduate studies at University of Louisiana at Monroe, following her interest to join the water ski team. She decided to pursue a career in veterinary medicine, and completed her bachelor’s degree in Animal Science from Louisiana Tech University. 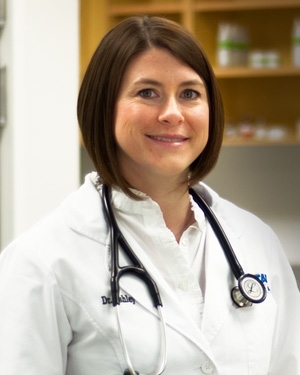 Dr. Turner earned her Doctorate of Veterinary Medicine from Louisiana State University in 2008. Dr. Turner worked in a fast-paced, small animal clinic in Shreveport for two years before joining the PetStar team in Ruston in 2010. She is now pursuing her dream of owning her own business. She is experienced in small animal medicine and surgery. She also brings expertise in treating exotics. Dr. Turner is a devoted wife to her husband, Troy, and a loving mother to her daughters, Ella and Amelia. She has two canine companions, Lola Jean and Delta Dawn. Dr. Turner enjoys reading, riding UTVs, and water skiing. She is truly a country girl! Dr. Camille Killian joined the PetStar family in June 2017 as an associate veterinarian. She was born and raised in the Shreveport, LA area. As a little girl, she always knew she wanted to become a veterinarian. She is a graduate of LA Tech with a Bachelor's degree in Animal Science and a graduate of LSU School of Veterinary Medicine. Dr. Killian is happily married to Caleb Killian, who is also a veterinarian. Together, they have two precious, mixed breed dogs, Lucy (the one in the picture) and Taco. An obvious animal lover, Dr. Killian says, “I am looking to rescue a cat soon!” Some of her favorite things to do are read books, play with the dogs, cook with her husband, and spend time with family. Dr. Killian holds a special interest in Animal Behavior and Veterinary acupuncture, and is pursuing certification in acupuncture soon! Dr. Alex Saunders is originally from Benton, LA. Upon graduation from Benton High School, Dr. Saunders pursued college baseball at LSU-Shreveport. After committing to becoming a veterinarian, he transferred to LA Tech to finish his undergraduate studies and graduated with a Bachelor’s of Science degree. 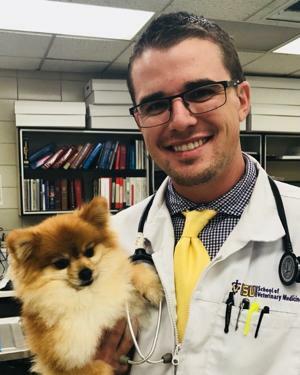 Dr. Saunders attended veterinary school at St. George's University in the Caribbean and finished his clinical rotations at LSU school of Veterinary medicine in Baton Rouge. He is especially interested in surgery, dentistry, and radiology. Dr. Saunders is happily married to Jessica, a science teacher, and together they have a little boy, Everett. In his off time, Dr. Saunders enjoys spending time with family, the great outdoors, sports, and cooking.